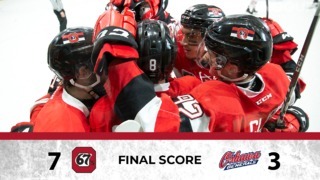 The Ottawa 67’s exploded for a season-high eight goals, with local players Nathan Todd and Ben Fanjoy leading the way with a pair each, during a convincing 8-2 victory over the Battalion on Sunday afternoon in North Bay. The win was Ottawa’s 20th of the season and marked the team’s second win (along with a shootout loss) in three games this weekend. Ottawa constructed a 4-0 lead in the opening period and had an 8-1 advantage heading into the final period. 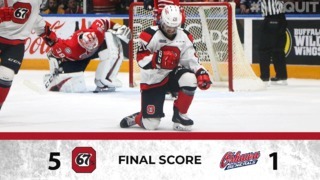 Newcomer Sasha Chmelevski, Artur Tyanulin, Jeremiah Addison and Austen Keating also scored for the 67’s, while Travis Barron and Dante Salituro each had three assists. 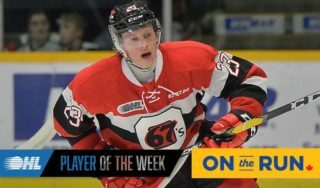 Goalie Leo Lazarev recorded his 15th victory of the season, making 32 saves for Ottawa, which improved to 20-19-1-1 on the season. 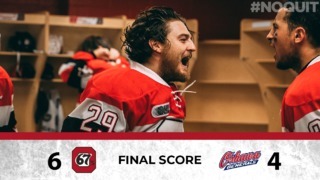 Ottawa is back at home at TD Place on Friday, January 15 against the Niagara IceDogs for a 7 p.m. face-off. Tickets are available by clicking here, by calling 613-232-6767, ext. 1, or in person at the TD Place Box Office.